BCA .223 Wylde 10.5" Upper w/ 10" Quad Rail: Comes with an 10.5" phos barrel 1:8 twist w/ carbine length gas system. These barrels have been very accurate. The 10" Quad Rail is from Guntech USA. Built with an Anderson upper receiver. We test fire all of our uppers to assure proper function and headspace. Not to mention we stand behind the uppers. So if you have any problems we will work with you to solve them. This upper is sold w/o the BCG & CH. Although we do carry several different Bolt Carriers and Charge Handles to complete your upper. To do this you would simply select which BCG & CH you want to be shipped with your upper plus you will save money buying them together. We do offer custom builds as well!! However you would have to call us for product availability and a quote. Need magazines?? Check out our magazine section and add some to your cart before you check out. BCA 5.56MM 8" Upper w/ 7" Quad Rail: Comes with an 8" black nitride barrel 1:7 twist w/ pistol gas system. These barrels have been both durable and accurate. The 7" quad rail is from Gun Tech USA. Built with an Anderson upper receiver. We test fire all of our uppers to assure proper function and headspace. Not to mention we stand behind the uppers. So if you have any problems we will work with you to solve them. This upper is sold w/o the BCG & CH. Although we do carry several different Bolt Carriers and Charge Handles to complete your upper. To do this you would simply select which BCG & CH you want to be shipped with your upper plus you will save money buying them together. We do offer custom builds as well!! However you would have to call us for product availability and a quote. Need magazines?? Check out our magazine section and add some to your cart before you check out. BCA 5.56MM 16" Upper w/ 12" Quad Rail: Comes with an 16" mag phos barrel 1:8 twist w/ carbine gas system. These barrels are made by Anderson Manufacturing and have been very accurate. The 12" quad rail is from Gun Tech USA. Built with an Anderson upper receiver. We test fire all of our uppers to assure proper function and headspace. Not to mention we stand behind the uppers. So if you have any problems we will work with you to solve them. This upper is sold w/o the BCG & CH. Although we do carry several different Bolt Carriers and Charge Handles to complete your upper. To do this you would simply select which BCG & CH you want to be shipped with your upper plus you will save money buying them together. We do offer custom builds as well!! However you would have to call us for product availability and a quote. Need magazines?? Check out our magazine section and add some to your cart before you check out. BCA 5.56MM 16" Upper w/ 15" Quad Rail: Comes with an 16" mag phos barrel 1:8 twist w/ carbine gas system. These barrels are made by Anderson Manufacturing and have been very accurate. The 15" quad rail is from Gun Tech USA. Built with an Anderson upper receiver. We test fire all of our uppers to assure proper function and headspace. Not to mention we stand behind the uppers. So if you have any problems we will work with you to solve them. This upper is sold w/o the BCG & CH. Although we do carry several different Bolt Carriers and Charge Handles to complete your upper. To do this you would simply select which BCG & CH you want to be shipped with your upper plus you will save money buying them together. We do offer custom builds as well!! However you would have to call us for product availability and a quote. Need magazines?? Check out our magazine section and add some to your cart before you check out. BCA 5.56MM 16" Upper w/ 10" Quad Rail: Comes with an 16" mag phos barrel 1:8 twist w/ carbine gas system. These barrels are made by Anderson Manufacturing and have been very accurate. The 10" quad rail is from Gun Tech USA. Built with an Anderson upper receiver. We test fire all of our uppers to assure proper function and headspace. Not to mention we stand behind the uppers. So if you have any problems we will work with you to solve them. This upper is sold w/o the BCG & CH. Although we do carry several different Bolt Carriers and Charge Handles to complete your upper. To do this you would simply select which BCG & CH you want to be shipped with your upper plus you will save money buying them together. We do offer custom builds as well!! However you would have to call us for product availability and a quote. Need magazines?? Check out our magazine section and add some to your cart before you check out. BCA .223 WYLDE 16" Upper w/ 10" Quad Rail: Are you familar with the .223 Wylde?? It is a 5.56 chamber designed to have a tighter tolerance for better accuracy while shooting .223 ammo. It will still shoot both 5.56 & .223 like your standard 5.56 barrel. This upper comes with an 16" mag phos barrel 1:8 twist w/ carbine gas system. These barrels are 100% made in the USA and are very reliable and accurate. The 10" quad rail is ready for accessories. Built with a US forged upper receiver like Anderson, Aero Precision etc.. depending on what we have in stock. We test fire all of our uppers to assure proper function and reliability. Not to mention we stand behind our builds and if you have any problems we will work with you to solve them. This upper is sold w/o the BCG & CH. Although we do carry several different Bolt Carriers and Charge Handles to complete your upper. To do this you would simply select which BCG & CH you want to be shipped with your upper plus you will save money buying them together. We do offer custom builds as well!! However you would have to call us for product availability and a quote. Need magazines?? Check out our magazine section and add some to your cart before you check out. 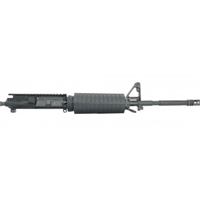 This a a Palmetto State Armory 16" A2 1:7 Twist Mid-Length Upper Assembly. Built by PSA and made in the USA!! Although we do carry several different Bolt Carriers and Charge Handles to complete your upper. To do this you would simply select which BCG & CH you want to be shipped with your upper plus you will save money buying them together. 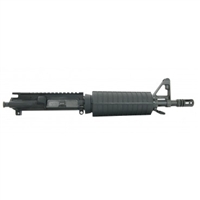 This a a Palmetto State Armory 16" Black Nitride A2 1:7 Twist Carbine Upper Assembly. Built by PSA and made in the USA!! 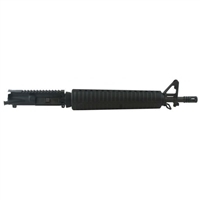 This a a Palmetto State Armory 10.5" Black Nitride A2 1:7 Twist Carbine Upper Assembly. Built by PSA and made in the USA!! BCA .223 WYLDE 16" Upper w/ 10" Quad Rail: Are you familar with the .223 Wylde?? It is a 5.56 chamber designed to have a tighter tolerance for better accuracy while shooting .223 ammo. It will still shoot both 5.56 & .223 like your standard 5.56 barrel. This upper comes with an 16" mag phos barrel 1:9 twist w/ carbine gas system. These barrels are 100% made in the USA and are very reliable and accurate. The 10" quad rail is ready for accessories. Built with a US forged upper receiver like Anderson, Aero Precision etc.. depending on what we have in stock. We test fire all of our uppers to assure proper function and reliability. Not to mention we stand behind our builds and if you have any problems we will work with you to solve them. This upper is sold w/o the BCG & CH. Although we do carry several different Bolt Carriers and Charge Handles to complete your upper. To do this you would simply select which BCG & CH you want to be shipped with your upper plus you will save money buying them together. We do offer custom builds as well!! However you would have to call us for product availability and a quote. Need magazines?? Check out our magazine section and add some to your cart before you check out. BCA .223 WYLDE 16" Upper w/ 10" Quad Rail: Are you familar with the .223 Wylde?? It is a 5.56 chamber designed to have a tighter tolerance for better accuracy while shooting .223 ammo. It will still shoot both 5.56 & .223 like your standard 5.56 barrel. This upper comes with an 16" mag phos barrel 1:7 twist w/ carbine gas system. These barrels are 100% made in the USA and are very reliable and accurate. The 10" quad rail is ready for accessories. Built with a US forged upper receiver like Anderson, Aero Precision etc.. depending on what we have in stock. We test fire all of our uppers to assure proper function and reliability. Not to mention we stand behind our builds and if you have any problems we will work with you to solve them. This upper is sold w/o the BCG & CH. Although we do carry several different Bolt Carriers and Charge Handles to complete your upper. To do this you would simply select which BCG & CH you want to be shipped with your upper plus you will save money buying them together. We do offer custom builds as well!! However you would have to call us for product availability and a quote. Need magazines?? Check out our magazine section and add some to your cart before you check out. BCA 5.56MM 10.5" Upper w/ 10" Rd KeyMod Rail: Comes with an 10.5" phosphate 1:7 twist w/ carbine gas system. These barrels are 100% made in the USA and are very reliable and accurate. The 10" keymod rail has a round profile. Built with a US forged upper receiver like Anderson, Aero Precision etc.. depending on what we have in stock. We test fire all of our uppers to assure proper function and reliability. Not to mention we stand behind our builds and if you have any problems we will work with you to solve them. This upper is sold w/o the BCG & CH. Although we do carry several different Bolt Carriers and Charge Handles to complete your upper. To do this you would simply select which BCG & CH you want to be shipped with your upper plus you will save money buying them together. We do offer custom builds as well!! However you would have to call us for product availability and a quote. Need magazines?? Check out our magazine section and add some to your cart before you check out. BCA 5.56MM 16" Upper w/ 10" Rd KeyMod Rail: Comes with an 16" mag phos barrel 1:8 twist w/ pistol gas system. These barrels are 100% made in the USA and are very reliable and accurate. The 10" keymod rail has a round profile. Built with a US forged upper receiver like Anderson, Aero Precision etc.. depending on what we have in stock. We test fire all of our uppers to assure proper function and reliability. Not to mention we stand behind our builds and if you have any problems we will work with you to solve them. This upper is sold w/o the BCG & CH. Although we do carry several different Bolt Carriers and Charge Handles to complete your upper. To do this you would simply select which BCG & CH you want to be shipped with your upper plus you will save money buying them together. We do offer custom builds as well!! However you would have to call us for product availability and a quote. Need magazines?? Check out our magazine section and add some to your cart before you check out. BCA 5.56MM 7.5" Upper w/ 7" KeyMod Rail: Comes with an 7.5" black nitride or phosphate barrel 1:7 twist w/ pistol gas system. These barrels are 100% made in the USA and are very reliable and accurate. The 7" keymod rail has a slim profile. Built with a US forged upper receiver like Anderson, Aero Precision etc.. depending on what we have in stock. We test fire all of our uppers to assure proper function and reliability. Not to mention we stand behind our builds and if you have any problems we will work with you to solve them. This upper is sold w/o the BCG & CH. Although we do carry several different Bolt Carriers and Charge Handles to complete your upper. To do this you would simply select which BCG & CH you want to be shipped with your upper plus you will save money buying them together. We do offer custom builds as well!! However you would have to call us for product availability and a quote. Need magazines?? Check out our magazine section and add some to your cart before you check out. BCA 5.56MM 16" Upper w/ 12" KeyMod Rail: Comes with an 16" melonite coated or phosphate barrel 1:8 twist w/ carbine length gas system. These barrels are 100% made in the USA and are very reliable and accurate. The 12" keymod rail has a slim profile. Built with a US forged upper receiver like Anderson, Aero Precision etc.. depending on what we have in stock. We test fire all of our uppers to assure proper function and reliability. Not to mention we stand behind our builds and if you have any problems we will work with you to solve them. This upper is sold w/o the BCG & CH. Although we do carry several different Bolt Carriers and Charge Handles to complete your upper. To do this you would simply select which BCG & CH you want to be shipped with your upper plus you will save money buying them together. We do offer custom builds as well!! However you would have to call us for product availability and a quote. Need magazines?? Check out our magazine section and add some to your cart before you check out. BCA .223 Wylde 18" Upper w/ 12" KeyMod Rail: Are you familiar with the .223 Wylde?? It is a 5.56 chamber designed to have a tighter tolerance for better accuracy while shooting .223 ammo. It will still shoot both 5.56 & .223 like your standard 5.56 barrel. This upper comes with an 18" .223 Wylde mag phos barrel 1:8 twist w/ mid length gas system. These barrels are 100% made in the USA and have been very reliable and accurate. The 12" keymod rail is a slim profile. Built with an American forged upper receiver. We test fire all of our uppers to assure proper function and reliability. Not to mention we stand behind our builds and if you have any problems we will work with you to solve them. This upper is sold w/o the BCG & CH. Although we do carry several different Bolt Carriers and Charge Handles to complete your upper. To do this you would simply select which BCG & CH you want to be shipped with your upper plus you will save money buying them together. We do offer custom builds as well!! However you would have to call us for product availability and a quote. Need magazines?? Check out our magazine section and add some to your cart before you check out. BCA .223 Wylde 7.5" Upper w/ 7" KeyMod Rail: Are you familar with the .223 Wylde?? It is a 5.56 chamber designed to have a tighter tolerance for better accuracy while shooting .223 ammo. It will still shoot both 5.56 & .223 like your standard 5.56 barrel. This upper comes with an 7.5" .223 Wylde barrel 1:7 twist w/ pistol gas system. These barrels are 100% made in the USA and are very reliable and accurate. The 7" keymod rail has a slim profile. Built with a US forged upper receiver like Anderson, Aero Precision etc.. depending on what we have in stock. We test fire all of our uppers to assure proper function and reliability. Not to mention we stand behind our builds and if you have any problems we will work with you to solve them. This upper is sold w/o the BCG & CH. Although we do carry several different Bolt Carriers and Charge Handles to complete your upper. To do this you would simply select which BCG & CH you want to be shipped with your upper plus you will save money buying them together. We do offer custom builds as well!! However you would have to call us for product availability and a quote. Need magazines?? Check out our magazine section and add some to your cart before you check out. BCA .223 Wylde 18" Upper w/ 15" KeyMod Rail: Are you familar with the .223 Wylde?? It is a 5.56 chamber designed to have a tighter tolerance for better accuracy while shooting .223 ammo. It will still shoot both 5.56 & .223 like your standard 5.56 barrel. This upper comes with an 18".223 Wylde Blk Nitride or Phosphate barrel 1:8 twist w/ mid length gas system. These barrels are 100% made in the USA and are very reliable and accurate. The 15" keymod rail has a slim profile. Built with a US forged upper receiver like Anderson, Aero Precision etc.. depending on what we have in stock. We test fire all of our uppers to assure proper function and reliability. Not to mention we stand behind our builds and if you have any problems we will work with you to solve them. This upper is sold w/o the BCG & CH. Although we do carry several different Bolt Carriers and Charge Handles to complete your upper. To do this you would simply select which BCG & CH you want to be shipped with your upper plus you will save money buying them together. We do offer custom builds as well!! However you would have to call us for product availability and a quote. Need magazines?? Check out our magazine section and add some to your cart before you check out. BCA 5.56MM 10.5" Upper w/ 9" KeyMod Rail: Comes with an 10.5" black nitride or phosphate barrel 1:7 twist w/ carbine length gas system. These barrels are 100% made in the USA and are very reliable and accurate. The 9" keymod rail has a slim profile. Built with a US forged upper receiver like Anderson, Aero Precision etc.. depending on what we have in stock. We test fire all of our uppers to assure proper function and reliability. Not to mention we stand behind our builds and if you have any problems we will work with you to solve them. This upper is sold w/o the BCG & CH. Although we do carry several different Bolt Carriers and Charge Handles to complete your upper. To do this you would simply select which BCG & CH you want to be shipped with your upper plus you will save money buying them together. We do offer custom builds as well!! However you would have to call us for product availability and a quote. Need magazines?? Check out our magazine section and add some to your cart before you check out. BCA 5.56MM 16" Upper w/ 10" KeyMod Rail: Comes with an 16" M4 profile phosphate barrel 1:8 twist w/ carbine gas system. These barrels are 100% made in the USA and are very reliable and accurate. The 10" keymod rail has a slim profile. Built with a US forged upper receiver like Anderson, Aero Precision etc.. depending on what we have in stock. We test fire all of our uppers to assure proper function and reliability. Not to mention we stand behind our builds and if you have any problems we will work with you to solve them. This upper is sold w/o the BCG & CH. Although we do carry several different Bolt Carriers and Charge Handles to complete your upper. To do this you would simply select which BCG & CH you want to be shipped with your upper plus you will save money buying them together. We do offer custom builds as well!! However you would have to call us for product availability and a quote. Need magazines?? Check out our magazine section and add some to your cart before you check out. BCA 5.56MM 10.5" Upper w/ 10" KeyMod Rail: Comes with an 10.5" black nitride barrel 1:7 twist w/ carbine gas system. These barrels are 100% made in the USA and are very reliable and accurate. The 10" keymod rail has a slim profile. Built with a US forged upper receiver like Anderson, Aero Precision etc.. depending on what we have in stock. We test fire all of our uppers to assure proper function and reliability. Not to mention we stand behind our builds and if you have any problems we will work with you to solve them. This upper is sold w/o the BCG & CH. Although we do carry several different Bolt Carriers and Charge Handles to complete your upper. To do this you would simply select which BCG & CH you want to be shipped with your upper plus you will save money buying them together. We do offer custom builds as well!! However you would have to call us for product availability and a quote. Need magazines?? Check out our magazine section and add some to your cart before you check out. BCA .223 Wylde 16" Barrel Upper w/ 12" KeyMod Rail: Are you familar with the .223 Wylde?? It is a 5.56 chamber designed to have a tighter tolerance for better accuracy while shooting .223 ammo. It will still shoot both 5.56 & .223 like your standard 5.56 barrel. This upper comes with an 16" .223 Wylde mag phos barrel 1:8 twist w/ carbine length gas system. These barrels are 100% made in the USA and are very reliable and accurate. The 12" keymod slim profile. Built with a US forged upper receiver like Anderson, Aero Precision etc.. depending on what we have in stock. We test fire all of our uppers to assure proper function and reliability. Not to mention we stand behind our builds and if you have any problems we will work with you to solve them. This upper is sold w/o the BCG & CH. Although we do carry several different Bolt Carriers and Charge Handles to complete your upper. To do this you would simply select which BCG & CH you want to be shipped with your upper plus you will save money buying them together. We do offer custom builds as well!! However you would have to call us for product availability and a quote. Need magazines?? Check out our magazine section and add some to your cart before you check out. BCA .223 Wylde 7.5" SS Upper w/ 7"Slant Nose KeyMod Rail: Are you familar with the .223 Wylde?? It is a 5.56 chamber designed to have a tighter tolerance for better accuracy while shooting .223 ammo. It will still shoot both 5.56 & .223 like your standard 5.56 barrel. This upper comes with an 7.5" .223 Wylde stainless steel barrel 1:7 twist w/ pistol gas system. These barrels are 100% made in the USA and are very reliable and accurate. The 7" slanted keymod rail is traditional round profile. Built with a US forged upper receiver like Anderson, Aero Precision etc.. depending on what we have in stock. We test fire all of our uppers to assure proper function and reliability. Not to mention we stand behind our builds and if you have any problems we will work with you to solve them. This upper is sold w/o the BCG & CH. Although we do carry several different Bolt Carriers and Charge Handles to complete your upper. To do this you would simply select which BCG & CH you want to be shipped with your upper plus you will save money buying them together. We do offer custom builds as well!! However you would have to call us for product availability and a quote. Need magazines?? Check out our magazine section and add some to your cart before you check out. BCA .223 Wylde 16" Barrel Upper w/ 12" KeyMod Rail: Are you familar with the .223 Wylde?? It is a 5.56 chamber designed to have a tighter tolerance for better accuracy while shooting .223 ammo. It will still shoot both 5.56 & .223 like your standard 5.56 barrel. This upper comes with an 16" .223 Wylde mag phos barrel 1:9 twist w/ carbine length gas system. These barrels are 100% made in the USA and are very reliable and accurate. The 12" keymod slim profile. Built with a US forged upper receiver like Anderson, Aero Precision etc.. depending on what we have in stock. We test fire all of our uppers to assure proper function and reliability. Not to mention we stand behind our builds and if you have any problems we will work with you to solve them. This upper is sold w/o the BCG & CH. Although we do carry several different Bolt Carriers and Charge Handles to complete your upper. To do this you would simply select which BCG & CH you want to be shipped with your upper plus you will save money buying them together. We do offer custom builds as well!! However you would have to call us for product availability and a quote. Need magazines?? Check out our magazine section and add some to your cart before you check out. BCA .223 Wylde 16" Barrel Upper w/ 12" KeyMod Rail: Are you familar with the .223 Wylde?? It is a 5.56 chamber designed to have a tighter tolerance for better accuracy while shooting .223 ammo. It will still shoot both 5.56 & .223 like your standard 5.56 barrel. This upper comes with an 16" .223 Wylde mag phos barrel 1:7 twist w/ carbine length gas system. These barrels are 100% made in the USA and are very reliable and accurate. The 12" keymod slim profile. Built with a US forged upper receiver like Anderson, Aero Precision etc.. depending on what we have in stock. We test fire all of our uppers to assure proper function and reliability. Not to mention we stand behind our builds and if you have any problems we will work with you to solve them. This upper is sold w/o the BCG & CH. Although we do carry several different Bolt Carriers and Charge Handles to complete your upper. To do this you would simply select which BCG & CH you want to be shipped with your upper plus you will save money buying them together. We do offer custom builds as well!! However you would have to call us for product availability and a quote. Need magazines?? Check out our magazine section and add some to your cart before you check out. BCA 5.56MM 16" Upper w/ 12" KeyMod Rail: Comes with an 16" melonite coated or phosphate barrel 1:7 twist w/ carbine length gas system. These barrels are 100% made in the USA and are very reliable and accurate. The 12" keymod rail has a slim profile. Built with a US forged upper receiver like Anderson, Aero Precision etc.. depending on what we have in stock. We test fire all of our uppers to assure proper function and reliability. Not to mention we stand behind our builds and if you have any problems we will work with you to solve them. This upper is sold w/o the BCG & CH. Although we do carry several different Bolt Carriers and Charge Handles to complete your upper. To do this you would simply select which BCG & CH you want to be shipped with your upper plus you will save money buying them together. We do offer custom builds as well!! However you would have to call us for product availability and a quote. Need magazines?? Check out our magazine section and add some to your cart before you check out. BCA 5.56MM 16" Upper w/ 10" MLOK Rail: Comes with an 16" M4 profile phosphate barrel 1:8 twist w/ carbine gas system. These barrels are 100% made in the USA and are very reliable and accurate. The 10" MLOK rail has a slim profile. Built with a US forged upper receiver like Anderson, Aero Precision etc.. depending on what we have in stock. We test fire all of our uppers to assure proper function and reliability. Not to mention we stand behind our builds and if you have any problems we will work with you to solve them. This upper is sold w/o the BCG & CH. Although we do carry several different Bolt Carriers and Charge Handles to complete your upper. To do this you would simply select which BCG & CH you want to be shipped with your upper plus you will save money buying them together. We do offer custom builds as well!! However you would have to call us for product availability and a quote. Need magazines?? Check out our magazine section and add some to your cart before you check out. BCA .223 Wlyde 20" Upper w/ 15" KeyMod Rail: Comes with an 20" mag phos barrel 1:8 twist w/ rifle length gas system. These barrels are 100% made in the USA and are very reliable and accurate. The 15" keymod rail has a slim profile. Built with a US forged upper receiver like Anderson, Aero Precision etc.. depending on what we have in stock. We test fire all of our uppers to assure proper function and reliability. Not to mention we stand behind our builds and if you have any problems we will work with you to solve them. This upper is sold w/o the BCG & CH. Although we do carry several different Bolt Carriers and Charge Handles to complete your upper. To do this you would simply select which BCG & CH you want to be shipped with your upper plus you will save money buying them together. We do offer custom builds as well!! However you would have to call us for product availability and a quote. Need magazines?? Check out our magazine section and add some to your cart before you check out. BCA .223 Wylde 18" SS Upper w/ 12" KeyMod Rail: Are you familar with the .223 Wylde?? It is a 5.56 chamber designed to have a tighter tolerance for better accuracy while shooting .223 ammo. It will still shoot both 5.56 & .223 like your standard 5.56 barrel. This upper comes with an 18" .223 Wylde stainless steel fluted barrel 1:8 twist w/ mid length gas system. These barrels are 100% made in the USA and are very reliable and accurate. The 12" keymod rail is slim profile. Built with a US forged upper receiver like Anderson, Aero Precision etc.. depending on what we have in stock. We test fire all of our uppers to assure proper function and reliability. Not to mention we stand behind our builds and if you have any problems we will work with you to solve them. This upper is sold w/o the BCG & CH. Although we do carry several different Bolt Carriers and Charge Handles to complete your upper. To do this you would simply select which BCG & CH you want to be shipped with your upper plus you will save money buying them together. We do offer custom builds as well!! However you would have to call us for product availability and a quote. Need magazines?? Check out our magazine section and add some to your cart before you check out.